It looks like it’s going to be an early spring. 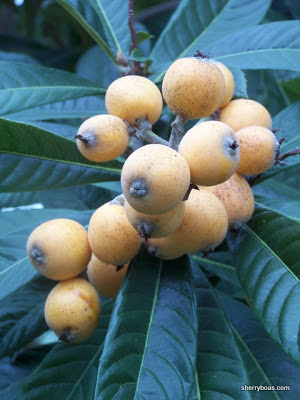 Loquats began ripening toward the end of January, a good month ahead of normal and the mulberry trees in our yard are flush with fruit. Blueberries are also ripening earlier than usual. While that’s one crop we don’t grow ourselves, we do take advantage of nearby farms that welcome u-pickers. One of our favorite U-pick operations is Lake CatherineBlueberries in Groveland (5849 Lake Catherine Rd, Groveland; 352-429-8221) run by Dustin and Jamie Lowe. According to Jamie Lowe, this year commercial picking should be starting in March and they expect to open their U-pick operation in early April. That’s a couple weeks ahead of last year, but I’m not complaining. I’ll gladly indulge in an early feast of local produce. My son’s girlfriend, Malory Foster, is among the new crop of garden enthusiasts eager to share a passion for plants with the public. Shortly after joining forces, Malory converted a sandy patch of weedy lawn into a verdant oasis of organic vegetables. One garden led to two, which led to a third as well as the installation of a small greenhouse. My husband and I have watched with nostalgic pleasure as the energetic couple sought out sources of local horse manure then proceeded to tote loads of the nitrogen-rich fertilizer to their property to mix with woodchips, peat and compost. Just as we did when we were starting out, Tim and Malory have managed to transform sadly deficient soil into a healthy composite of produce-supporting nutrients. Malory’s gardens now provide enough surplus vegetables to launch a small CSA (Community Supported Agriculture) in addition to a stand at the Clermont Farmer’s Market on Sundays. The kitchen garden: arugula, Siberian kale, lettuce, broccoli, bok choy, Swiss chard — at The Food Forest at Beautiful Bamboo Farm. I find myself encouraged by the surging interest in edible landscapes. Even in small spaces like patios, balconies and postage-stamp-sized front yards, people have begun to realize how much sense it makes to grow a few vegetable, herb or fruiting plants. Perhaps the abundance of online information has helped. Anyone who wants to learn how to grow a particular plant need only do an Internet search for how-to videos. Consider tomatoes. A Google search on “how to grow tomatoes” yields 1.2 million posts by people eager to teach others how to do everything from plant tomato seeds to trellis growing plants, to preserving their harvest. In addition to reconnecting with high school classmates, Facebook is a great place to find others who share common interests. Both experienced and would-be gardeners can join any of Facebook’s many specialty groups set up by individuals with passion for particular aspects of homegrown goodness. One of the Facebook groups I find particularly inspiring is called Grow Food Not Lawns (website: www.growtest.org), which strives to spread the word about sustainability, permaculture and edible landscaping. Fortunately for those who either don’t have the opportunity or interest in growing their own food, people like Malory Foster, Dustin and Jamie Lowe and numerous other small-scale, local farmers have stepped up to the plate. Their willingness to dedicate the time, labor and resources needed to provide the public with fresh grown, local foods is a welcome addition to the community. No matter whether the growing season is running early like it is this year, late or along normal lines, it’s good to know resources are available to make locally grown foods more accessible to anyone with the desire to seek out a more nutritious (and delicious!) way of eating.